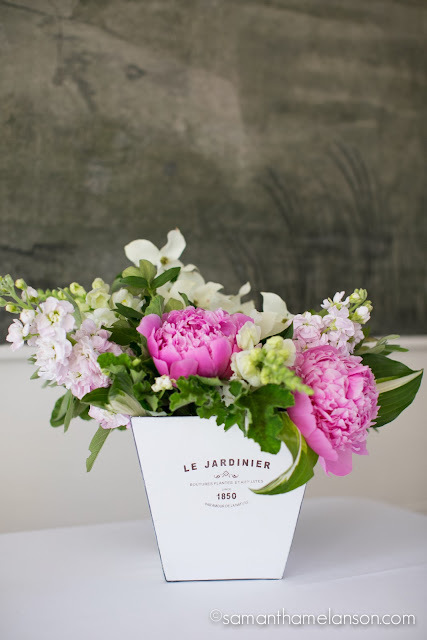 nicole and i first met at the shop in andover and it was a match made in les fleurs flower heaven! i enjoyed her enthusiasm for the flowers and all that was fresh and beautiful! we choose nicole and erik's blooms by what would be the most abundant and lush for their june wedding. 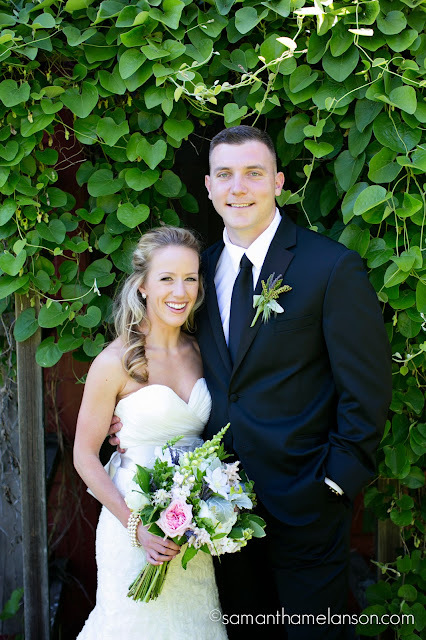 we could not have been happier at the way everything came together. nicole and her mom collected all the vases and containers we used throughout the day. summer greens, whites, pale pinks and barely-there purples were just the fresh pop the tent needed. 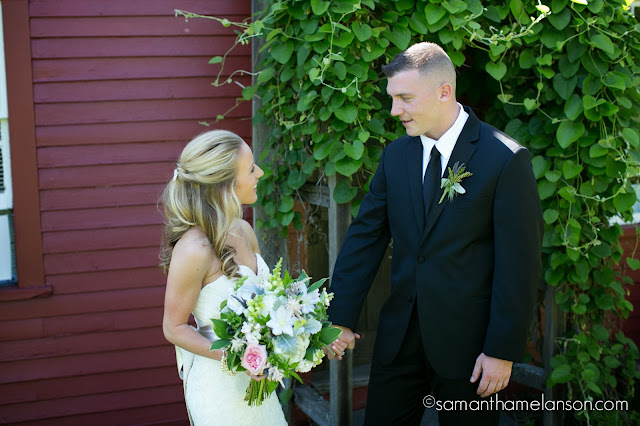 the couple wed at fruitlands museum in harvard, massachusetts. fruitlands boasts a beautiful backdrop for a wedding. 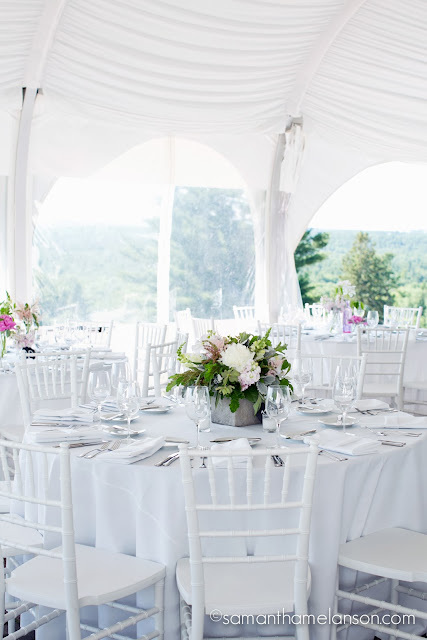 ceremonies can take place on top of the hill where guests are sure to enjoy the beautiful new england scenery, (in the fall the foliage is breath-taking) followed by dinner and dancing under the tent. 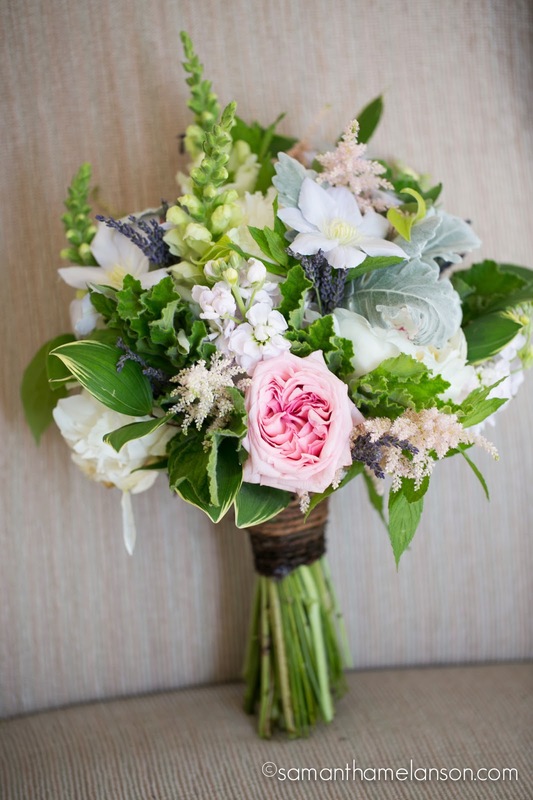 nicole's bouquet was soo full of june blossoms. garden astilbe and clematis were mixed with snap dragons and stock. beautiful pink "miranda" garden roses and "festiva maxima" peonies. 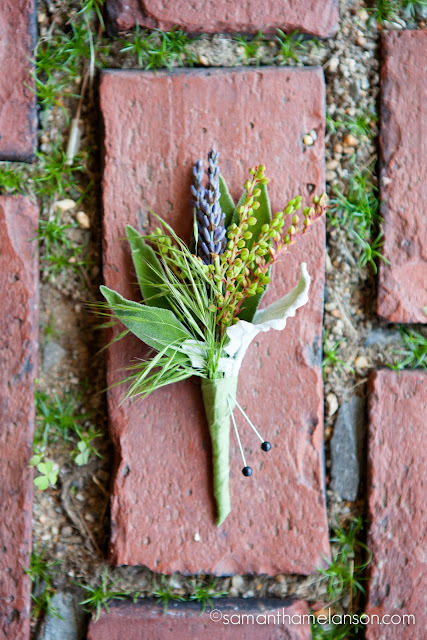 lavender, scented geranium leaves, hosta leaves, solomon seal foliage, mint, dusty miller... you know, to name just a few ;o) jute twine was the perfect way to finish nicole's bouquet. the gentlemen's boutonnieres were all a bit different. lush plumes of babies breath gathered together with maiden hair fern & hosta were ethereal and clean in mason jars hung from bark twine down the aisle. 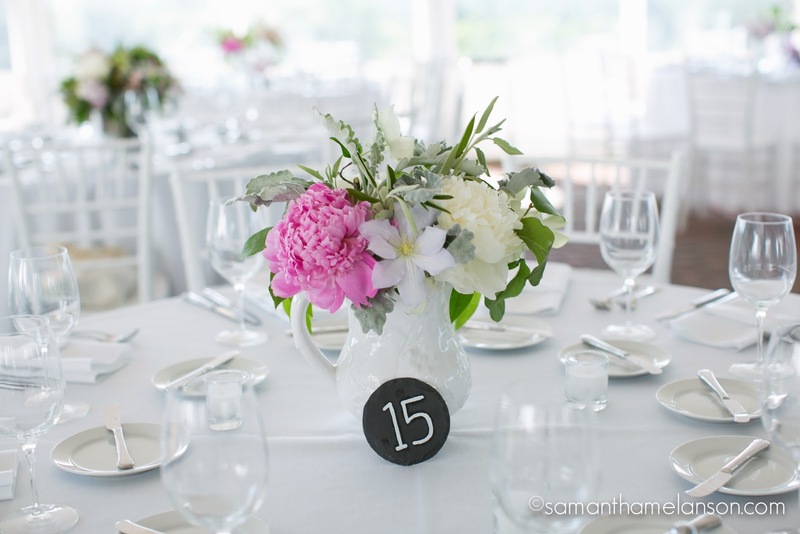 professional word of advise (aka, kerianne's thought): with vast backdrops simple aisle decor looks best. when choosing ceremony site's with a view, remember just that... the view! 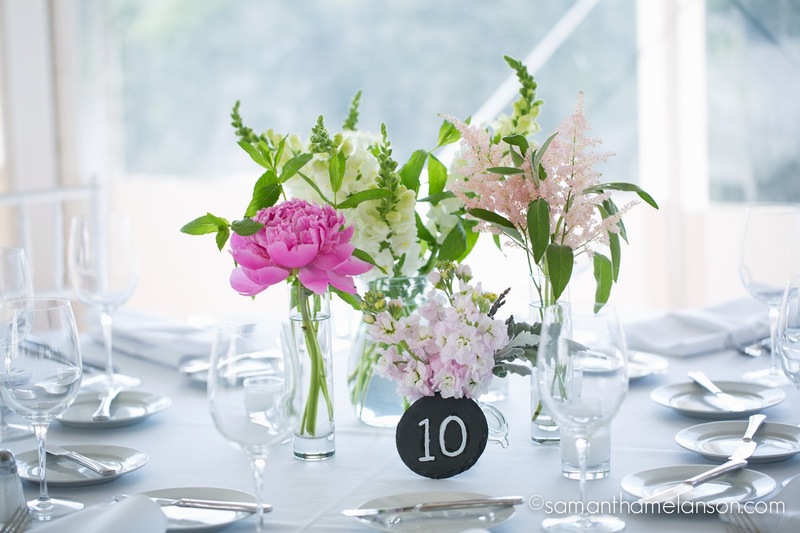 adding to much down the aisle can be overwhelming and the end result take away from the scenery. 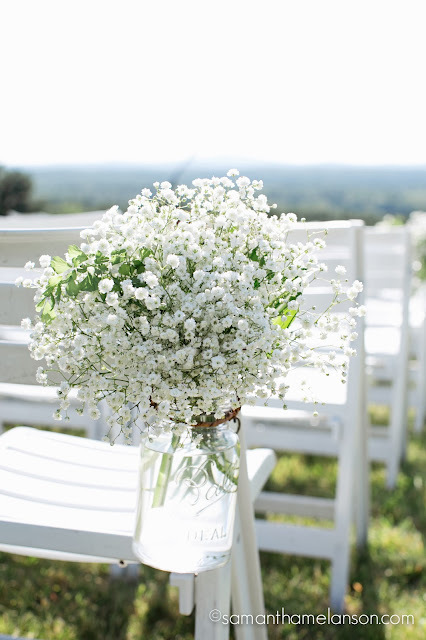 i love the babies breath below... soo simple, but gives the aisle a little somthin' somthin'. under the tent fresh arrangements added soft color to the tables. filling the collection of bud vases & pitchers nicole and her mom found each table had it's own look. 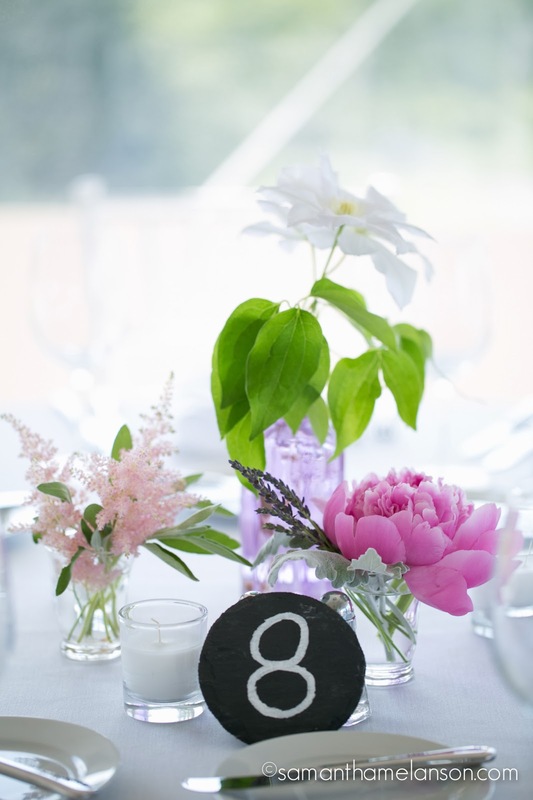 we added some great stone square planters from les fleurs to add a larger arrangement to some of the guest tables bringing the whole look together. 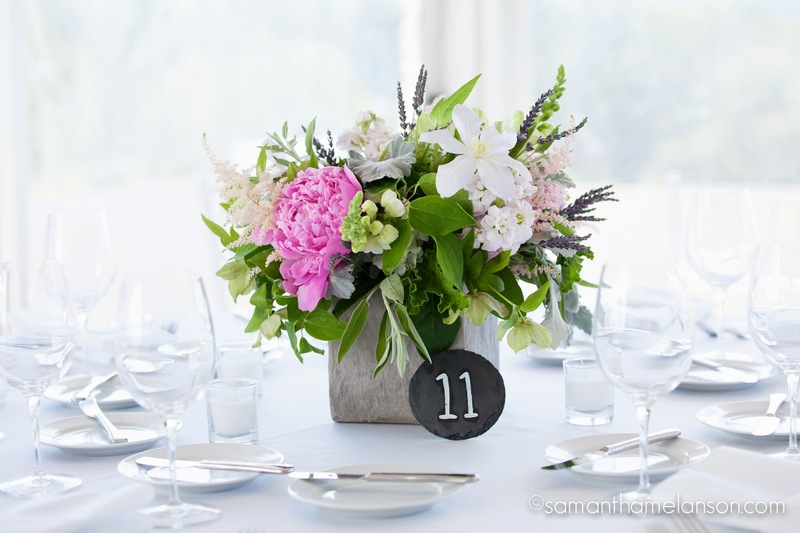 it's important to remember when doing small vases or many types of finishes to have a few larger arrangements to "weight" the space and create a cohesive feel in the room. the bud vases were either clear glass in a mix of sizes and shapes, lavender glass bottles or white milk glass. 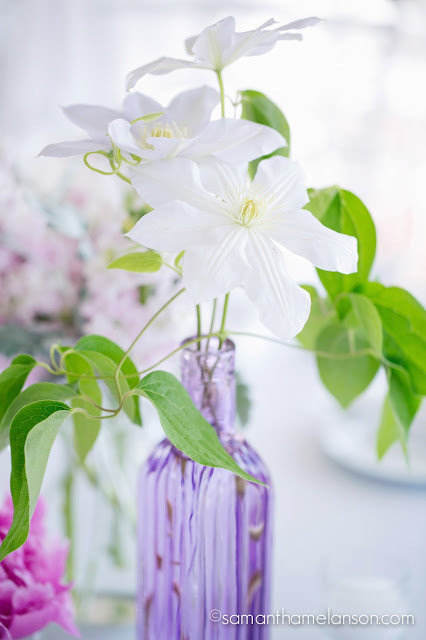 white clematis, white snap dragons and white peonies looked great in the purple bottles. "jules" peonies, apple bloom stock and pale pink astilbe were used in other vases to create the table arrangements. sweet accents like dusty miller, lavender, mint & sage looked lovely with the blooms. thank you samantha melanson for sharing the beautiful pictures!!! our work looks soo lovely! !